Our iTubes add scale and height to the play area. 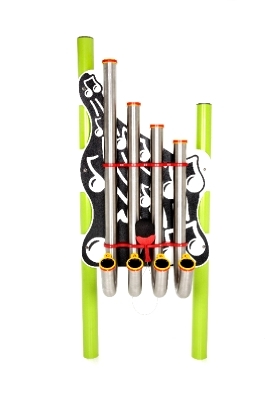 They consist of four tuned stainless steel J-shaped tubes mounted on a heavy duty HDPE support panel which make a deep soft sound similar to a bass guitar when struck with the specially designed paddle. The panel is mounted on two aluminium support posts which can be powder coated in a range of colours. Copyright Outdoor Musical Instruments and Sensory Play Equip 2019©. All Rights Reserved.